Two robbers who laughed after spraying women in their faces with cleaning fluid have been jailed for 10 years. 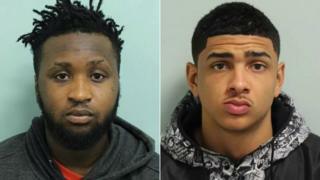 Rapper Sadik Kamara, 24, known as Trizzy Trapz, and Joshua Jordan, 20, both of Newham, east London, used the ammonia to target "petite women" who would not be able to fight back. Judge John Dodd QC jailed them for the "horrifying, cruel and barbaric" crimes which he said were "gratuitous". Both women they attacked suffered facial burns but were not disfigured. Prosecutor Benn Maguire told the Old Bailey how the defendants were among a gang of five who set out to deliberately target "petite women" to rob on 10 March. "During the robbery and undoubtedly to instil fear in the minds of their victims, the attackers sprayed ammonia into the faces of their victims," he said. "Any attempt to shout for help has resulted in ammonia being sprayed into the open mouths of the female victims - cowardly in the extreme." The pair were previously found guilty of using the corrosive fluid with intent to injure or cause grievous bodily harm. They were also convicted of robbery and attempted robbery. Jailing Kamara and Jordan for 10 years with four years on extended licence, the judge said: "These are dreadful and shocking offences. You chose to rob women who would have stood no chance against you, a gang of five men. "Even if you were unarmed, you still chose to take ammonia with you and use it against two slight women." In one attack in Hackney, shopkeeper Quyen Bei, 51, fought off the raiders. Four men with faces covered were captured on CCTV as they entered the store wearing hoods and gloves. During the attempted robbery, Kamara squirted ammonia in Mrs Bei's face at least three times. The other robbers, including Jordan, struggled with Mrs Bei, who was punched to the ground and kicked. She managed to press the panic alarm despite suffering burns to her face. The gang fled empty-handed. About 10 minutes later, the defendants attacked a random woman in the street, the court heard. The pair forced Vietnamese Thi Le Nguyen, 49, to the ground and one pinned her face to the pavement while the other repeatedly sprayed her face with the cleaning fluid. They snatched her handbag and ran back to their getaway car laughing together. Bottles of household cleaner containing high-strength ammonia were found nearby, clearly marked with warnings it could cause "severe skin burns and blindness". Following sentencing, Det Con Ben Kahane said: "The level of violence used was completely disproportionate. "The witness testimony describing how two of the suspects ran off laughing I think sums up the callous enjoyment the gang felt in targeting their victims."